Simplicity AI have announced that a major update to their popular Custom PDF Generator for LabVIEW has just been released. 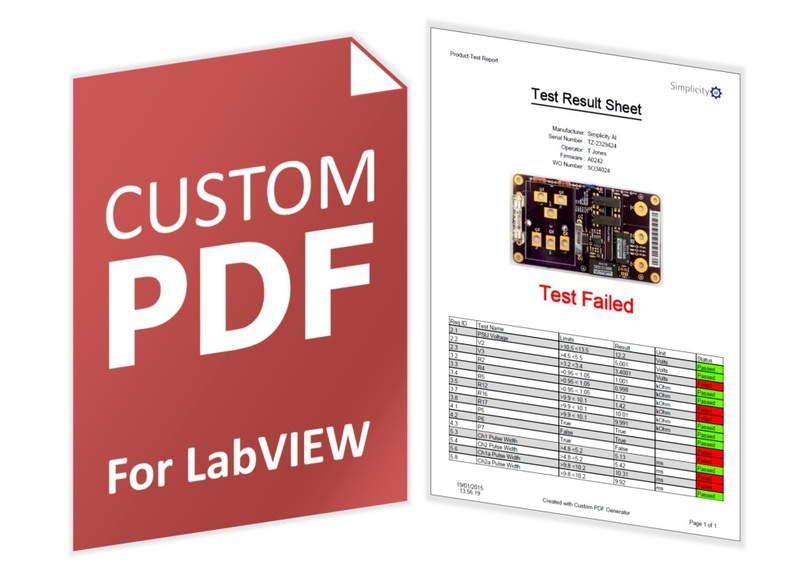 This toolkit enables LabVIEW users to easily create PDF reports directly from their VI code. Version 3 of the custom PDF Generator contains a number of new and updated features compared to previous versions; particularly in the area of table creation. Users can now individually control formatting options such as text and background color for each row, column, or cell. Data table creation has been significantly updated with the new table builder functionality. This gives complete control of table formatting down to each individual cell. You can now individually set cell background and text colors in your test reports tables, or include custom graphics. Page headers and footers can now be fully customized. Add text, custom images and tables as you require them. Use tokenised shortcuts for easy display of page numbering and time stamps. The Custom PDF Generator now supports Unicode characters, to enable support of many languages. Create text in Chinese Russian, Serbian, Punjabi, Korean, Bengali, or many other languages of your choice. Development license activation in now automated on internet connected computers. The help pages and getting started guide have been thoroughly revised. When importing existing PDFs there are now scaling options. Despite being packed with even more features, the Custom PDF Generator is now available at a significantly lower price. In addition, there are special reductions for multiple purchases beginning with a 20% reduction on a quantity of 5 or more. Based in Farnborough in the United Kingdom, Simplicity AI provides a range of advanced technical products and services for test, measurement, control and automation. Customers span across a whole spectrum of industry areas including, aerospace, defense, electronics, telecoms and medical devices.